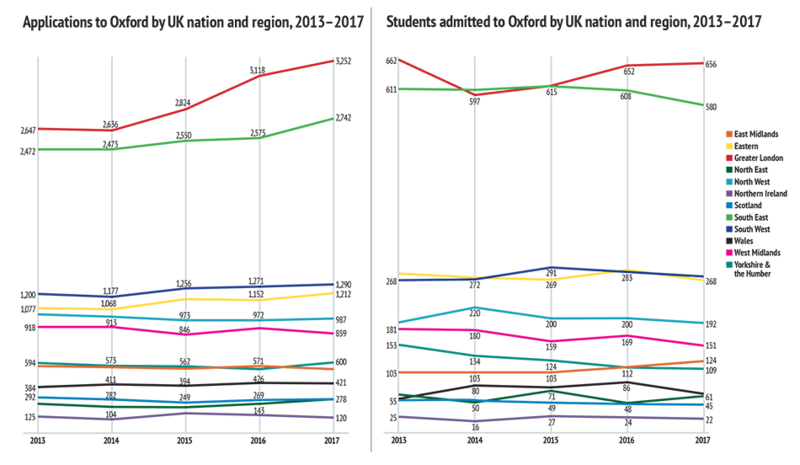 This page breaks down Oxford’s UK-domiciled undergraduate student total to show the regional distribution of the University’s applicants, offer holders and admitted students. The regional distribution of admissions to Oxford reflects population size, achievement in school, and application numbers. London and the South East made up 46.7% of UK applications between 2015 and 2017, and 47.9% of students admitted; the rest of the UK made up 53.3% of applications and 52.1% of students admitted. 3. One application was submitted from a student whose UK region was not known. This application has been excluded. 4. 2011 UK census. Sources: Office for National Statistics, National Records of Scotland, Northern Ireland Statistics and Research Agency. *First-year, first-degree, UK-domiciled undergraduate students, academic year 2015/16. Includes equivalent Scottish qualifications. See note on HESA data for full citation. For further information on all Oxford's admissions statistics, including by course and by college, please read the Annual Admissions Statistical Report. You may also be interested to see detailed statistics relating to UK regions, Local Authority areas and Parliamentary Constituencies.